of the Revolutionary Armed Forces of the Republic of Cuba. Two senior lawmakers representing the Communist Party propose to deploy missile systems to Cuba and resume the work of the Lourdes spy base in reply to US plans that could threaten Russia and its allies. According to Parlamentskaya Gazeta daily, Valery Rashkin and Sergey Obukhov addressed President Vladimir Putin with a letter in which they write that they had learned of the Pentagon’s plans to place HIMARS multiple-launch missile systems in Turkey. The lawmakers then noted that due to their relatively long range (up to 500km) these systems can pose a threat to member-countries of the Russia-led military bloc Collective Security Treaty Organization (CSTO), in particular Armenia. 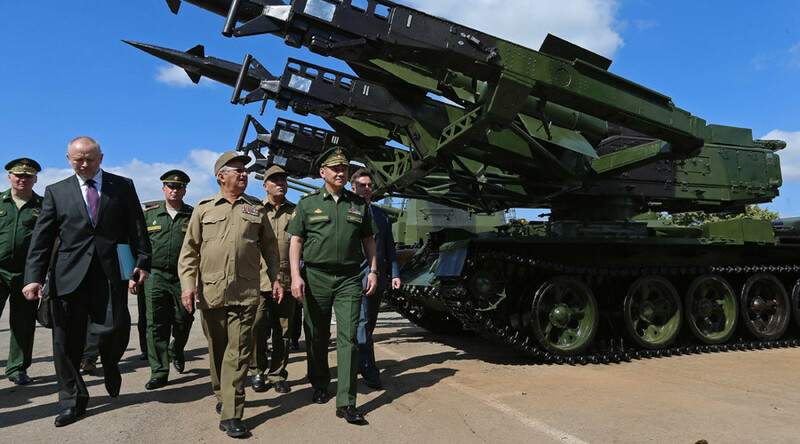 To protect Russia’s interests and secure the safety of its allies, the Communist lawmakers proposed resuming the work of the Lourdes electronic intelligence base in Cuba and also deploying Russian missile complexes on the island. They emphasized that these steps could be taken under the existing friendship and cooperation treaty between the Russian Federation and the Republic of Cuba. Rashkin and Obukhov also forwarded copies of their letter to Defense Minister Sergey Shoigu and Foreign Minister Sergey Lavrov. The recipients of the message have not immediately issued any comments but deputy head of the upper house Committee for International Relations, Vladimir Djabarov, told Life news portal that in his view the proposal is a just a populist step on the Communists’ part. “First, the situation on Cuba is different now – they have restored the diplomatic relations with the United States. Second – placing missiles there would have no effect on our security. Therefore this is just a populist proposal which hardly matches the interests of our country’s security,” the senator said. Russia had a major electronic intelligence base, the SIGINT facility, in Lourdes, Cuba, since 1967. The base was the largest of all Soviet intelligence centers abroad with 3,000 personnel. After the Soviet Union collapsed, the base was downscaled, but continued operation. In 2001, the Lourdes intelligence center stopped its operations mainly because of high costs. The Soviet Union put 40 nuclear-capable ballistic missiles on Cuba in 1962 in reply to the United States’ deployment of their medium-range Jupiter missiles in Turkey. Tensions quickly escalated into the so-called Cuban Missile Crisis and many experts agree that the two nations were very close to a full scale nuclear war. The ensuing talks ended in mutual removal of the weapons from both Turkey and Cuba.